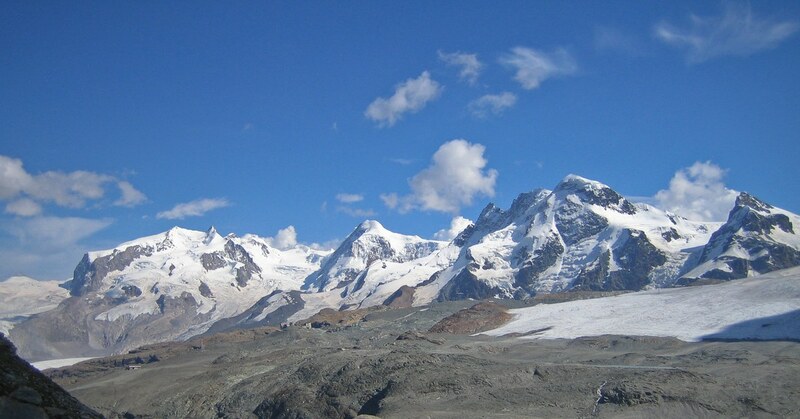 On Thursday morning we drove over to Randa where one has to park the car in a huge garage and take a cogwheel train for the short ride to Zermatt. 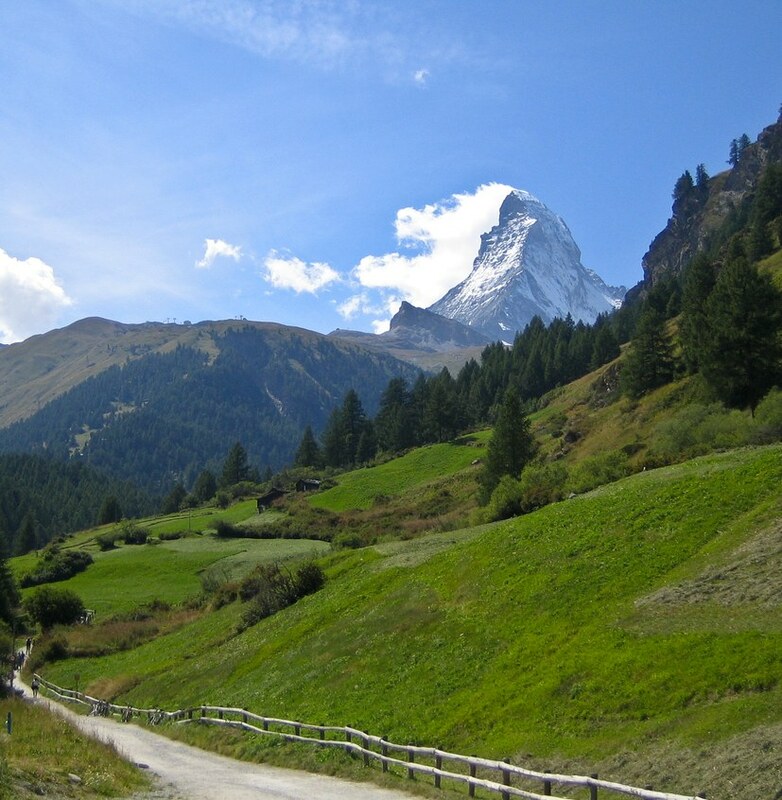 Zermatt, beautifully situated below the Matterhorn, is a car-free town. There are only some electric cars allowed. 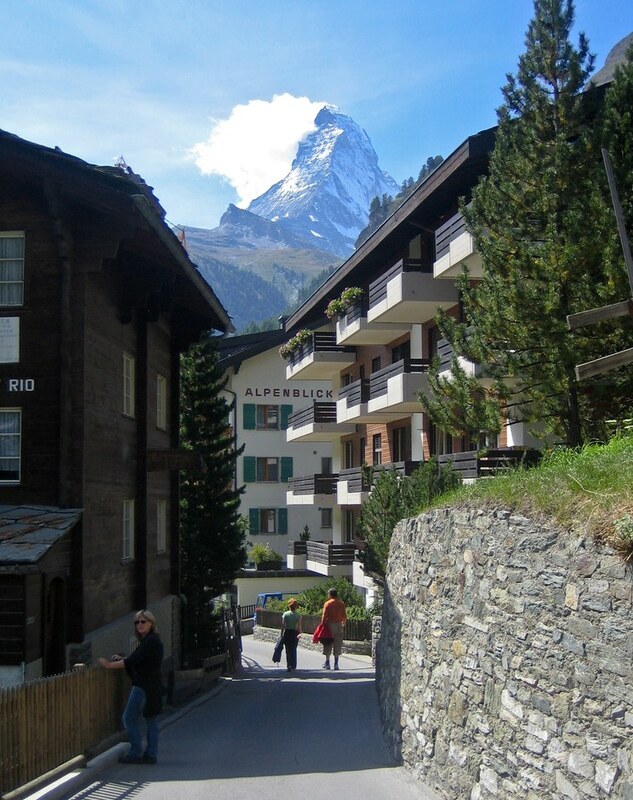 After we arrived at the train station in Zermatt, we crossed the town while passing by lots of touristy and expensive shops to reach the gondola that took us to Schwarzsee . 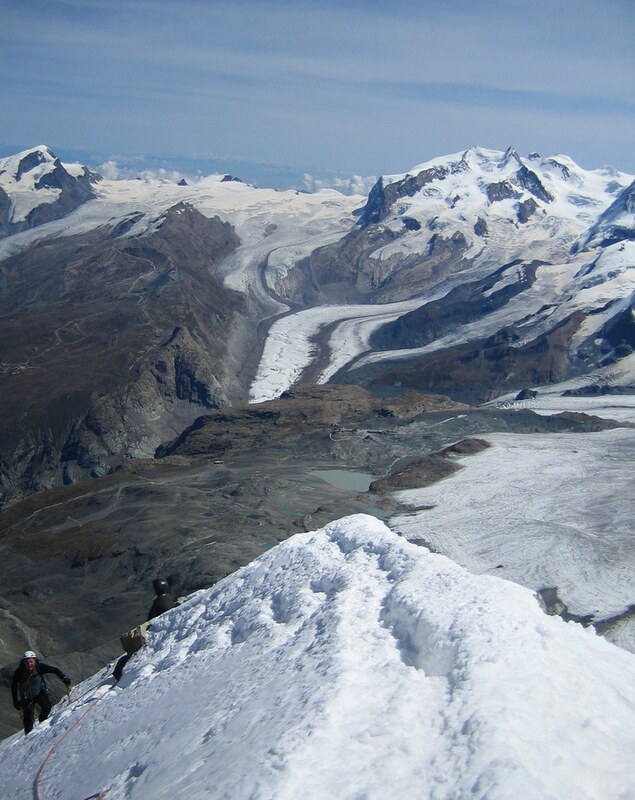 From there we enjoyed the magnificent views of the Monte Rosa group. 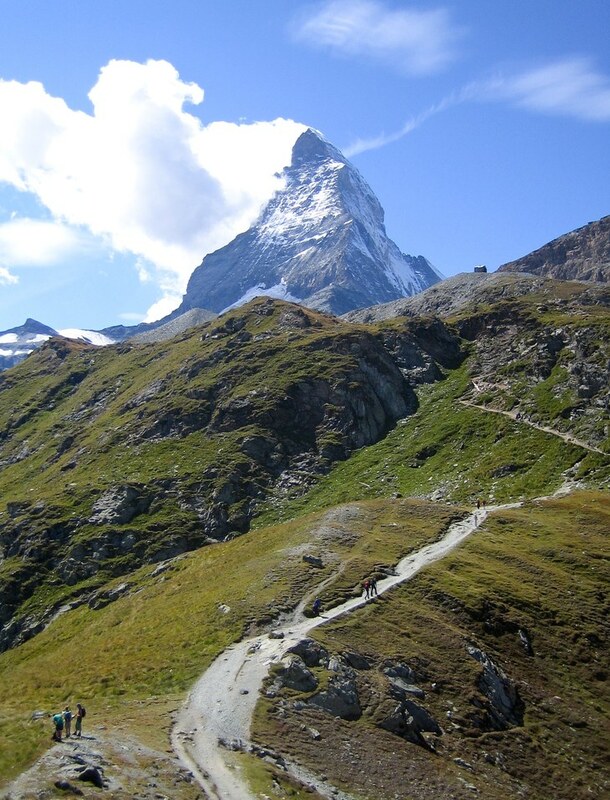 Most impressive, however, is the sight of the Matterhorn with its characteristic pyramid-like shape. 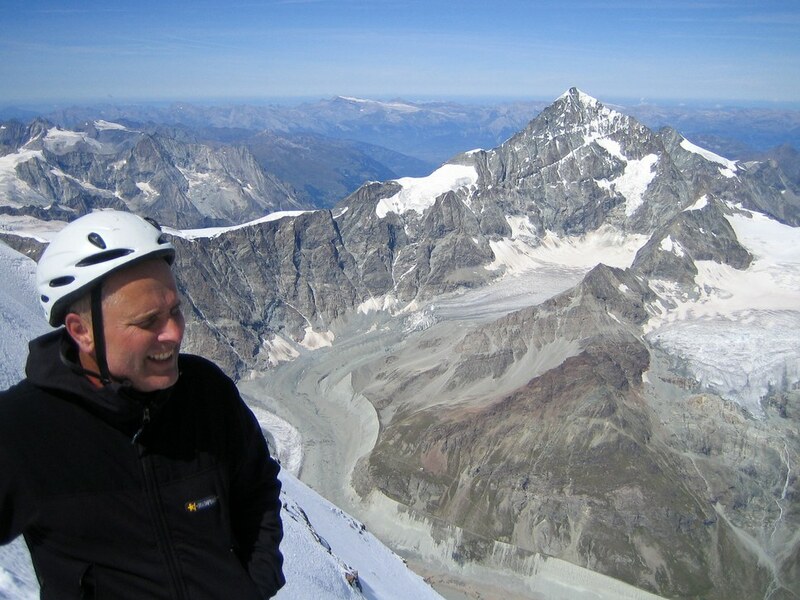 We took our time for the 2 hour hike up to the Hörnli hut. We were fairly early and had enough time to shoot pictures and take in the magnificent views. 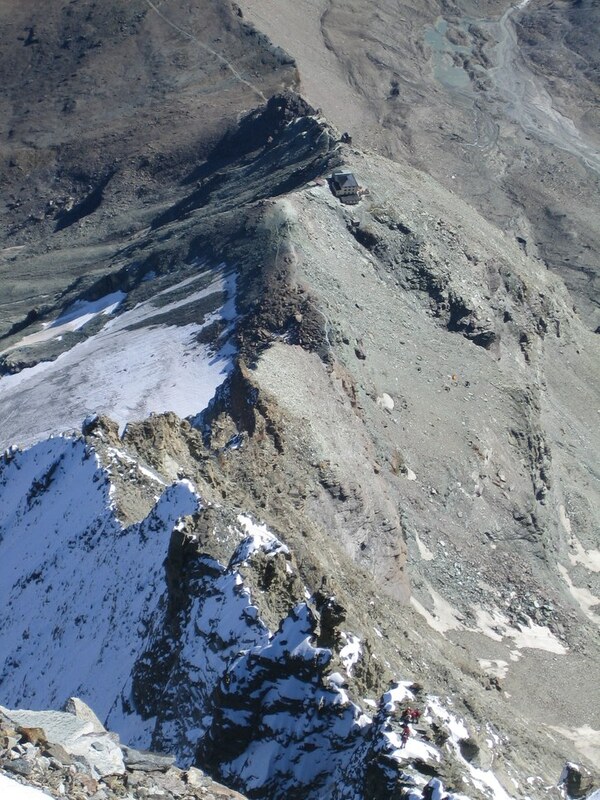 Slowly, however, the hut filled with climbers and mountain guides. During good weather periods like this one the hut is usually booked. We enjoyed our dinner and went to bed early to get some rest for the next day. We were woken up at 4:30am. When I stumbled down for breakfast it seemed that most parties had already eaten or even skipped breakfast altogether and were already on their way. 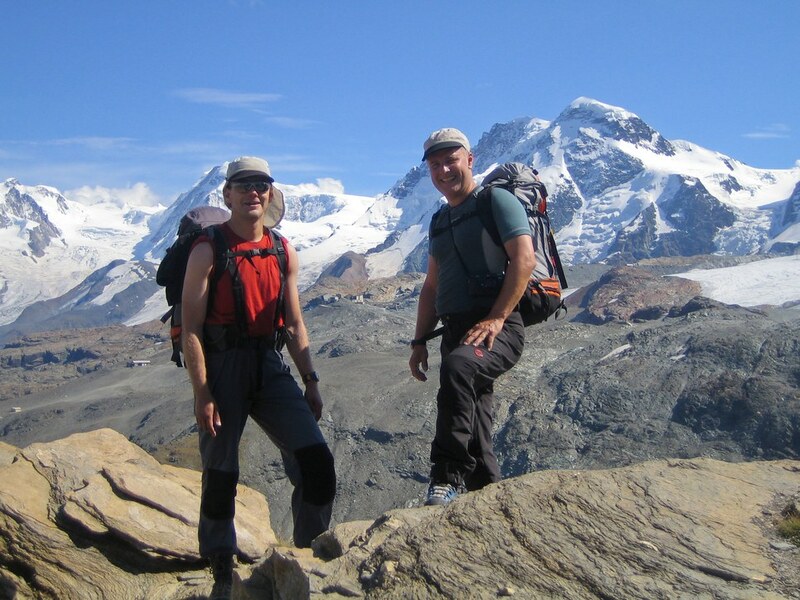 Somewhere I had read that there is a certain order at which guides get there breakfast: First there are the local guides from Zermatt with their clients. After that the Swiss guides, followed by international guides. Unguided parties are last in line. I don't know if that is true and we were too late and too sleepy anyway to check it. Since a breakfast is important to get a good start into the day, we took our time. After a while the last parties put on their gear and we were left alone. I had investigated the first part of the route the day before and since it is a steep pitch up some rock cracks we figured that this would probably be a bottle neck anyway and that there was no need to hurry. At 6:00am we were finally on our way to the start of the route. 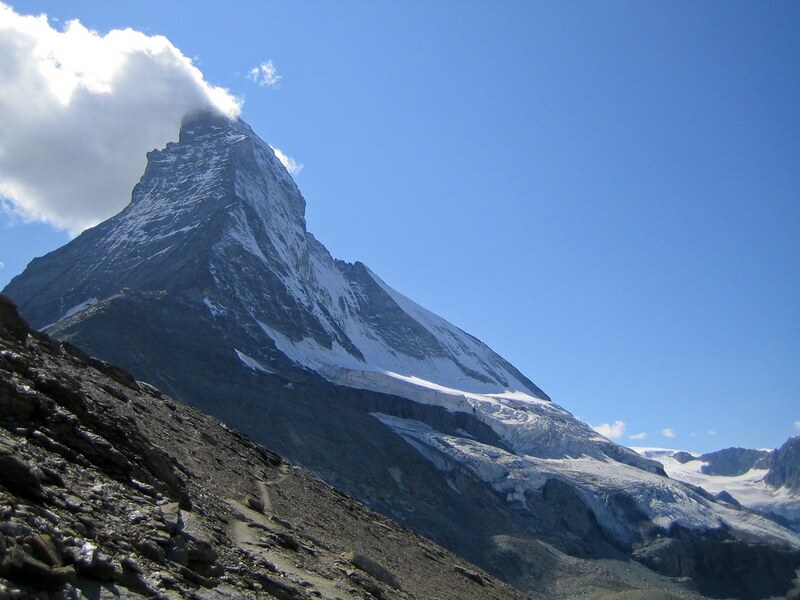 The Matterhorn has a nice pyramid shape and there are four ridges that lead to the summit. 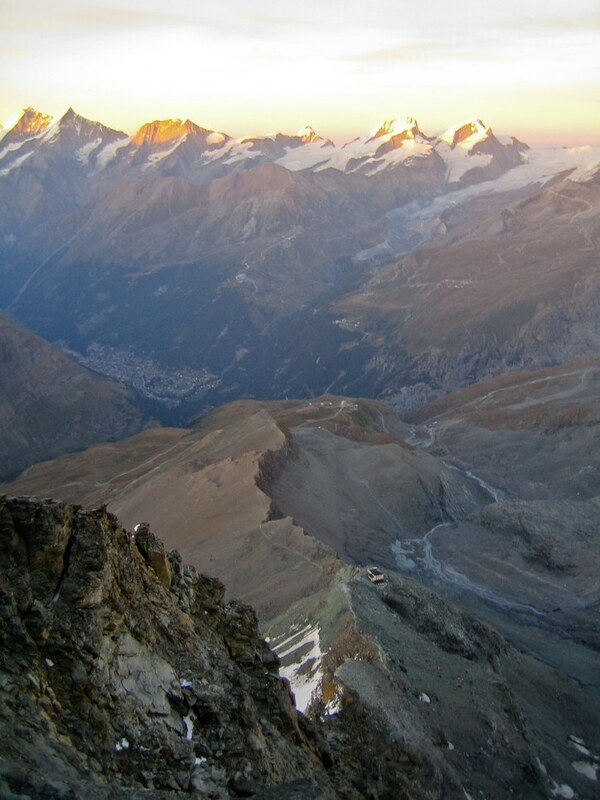 The normal route from the Swiss side is the Hörnli ridge which is in the middle of the classic picture of the Matterhorn from Zermatt. 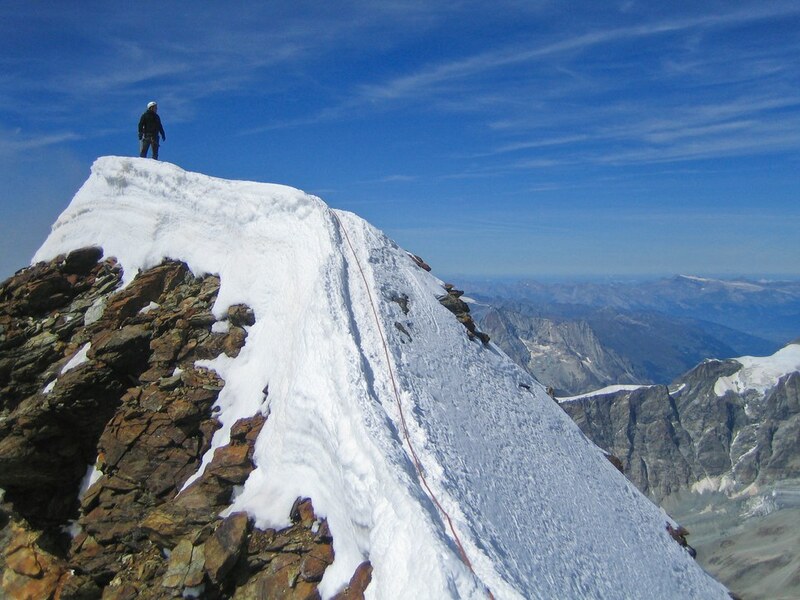 It's considered the easiest route to the summit but it is not an easy route. It is rated AD. 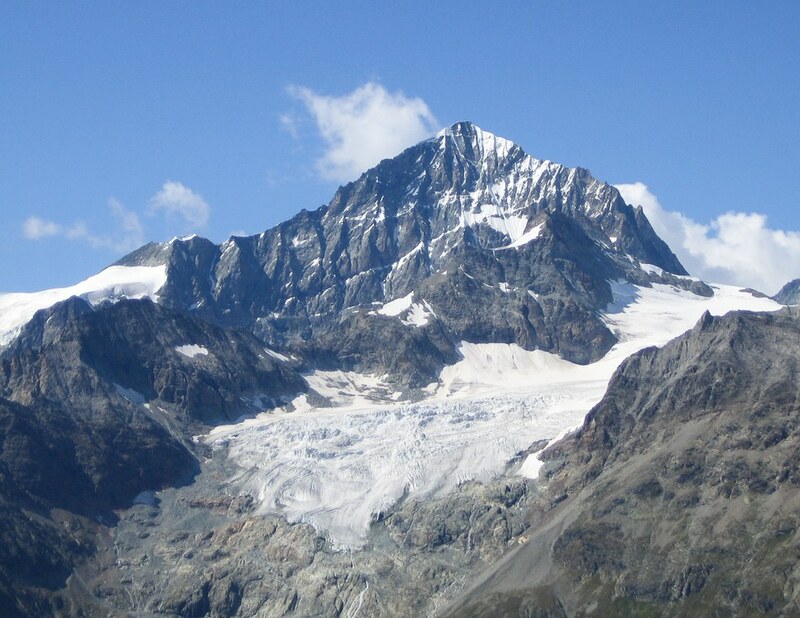 Even though the climbing never gets harder than III- (about 5.4), the elevation gain from the Hörnli hut (3260 m) to the summit is 1200 m and requires concentration throughout. The route is also not always easy to find. Especially in the lower part there are wrong spurs all over the place that have been taken by people in the past. 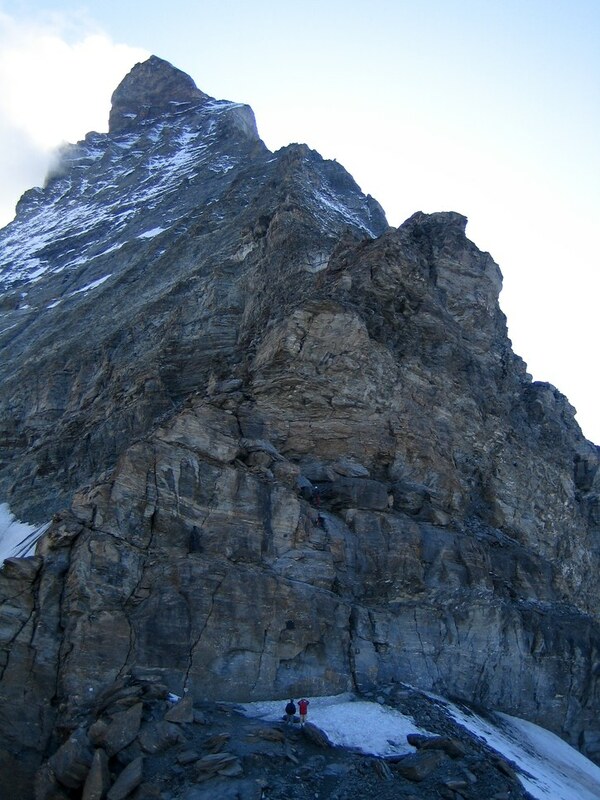 There are crampon scratches everywhere and even a number of misleading cairns. In the guide book by the Swiss Alpine Club, where route descriptions are usually half a page or maybe one page, the description for the Hörnli ridge is over 5 pages long. 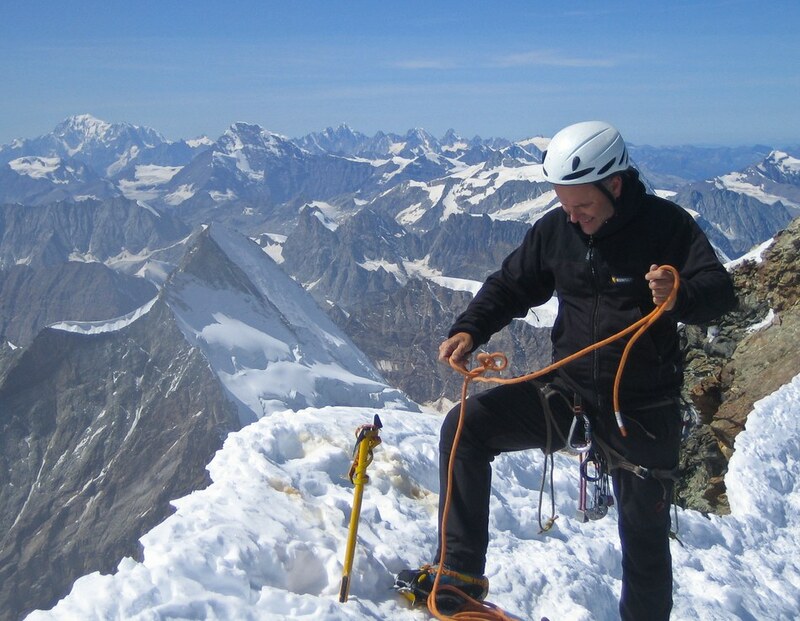 Then there is an equally long description for the descend of the route for people who have taken one of the other routes to the top and want to descend the Hörnli ridge. Because of this, most people take a guide for the steep price of about 1000 Swiss Francs (about USD 950) per person. I had read the description a few times and tried to memorize as much as possible. Peter had a quick look in the evening but after reading a few pages he gave up and stated that his navigational sense has not let him down in the past and will lead us straight to the top. When we arrived at the start of the route, a mere 5 minutes walking from the hut, we saw a bunch of headlamps already 1/3 up the ridge. There was no traffic jam and we quickly managed the crack section. Even though we had to walk in the dark during this first hour Peter indeed did a great job in finding the correct route route. When the sun came up the route was easier to follow but we still had to look carefully. We did miss it at some point and had to traverse some ugly scree but Peter quickly found the route again. Indeed, there are crampon scratches and spurs all over the place. Finally we reached the tiny Solvey hut, which is supposed to be for emergencies only and is situated about halfway up the ridge. At that point we met some guided parties who were on there way back down from the summit. 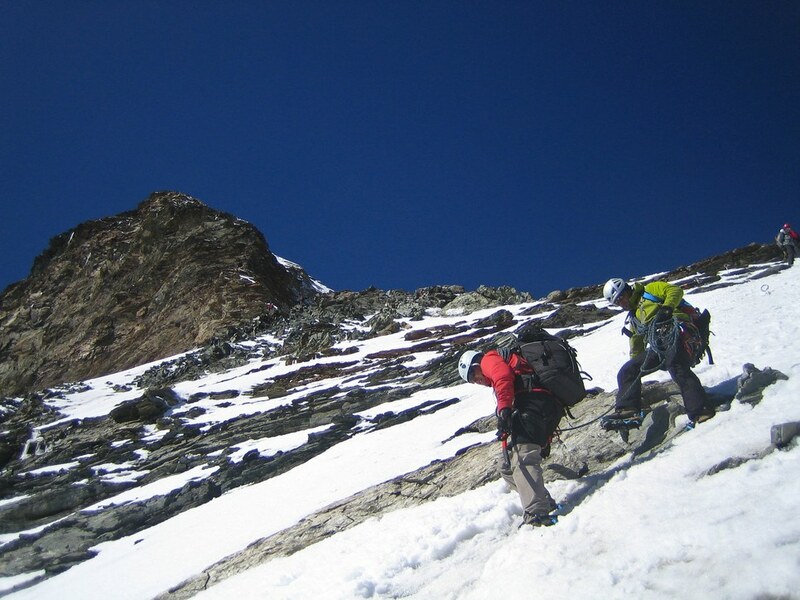 According to the guide book, it takes a guided party about 4 hours to reach the summit. Well, we had taken nearly that time to get half way up the route! We knew that time would become an issue. 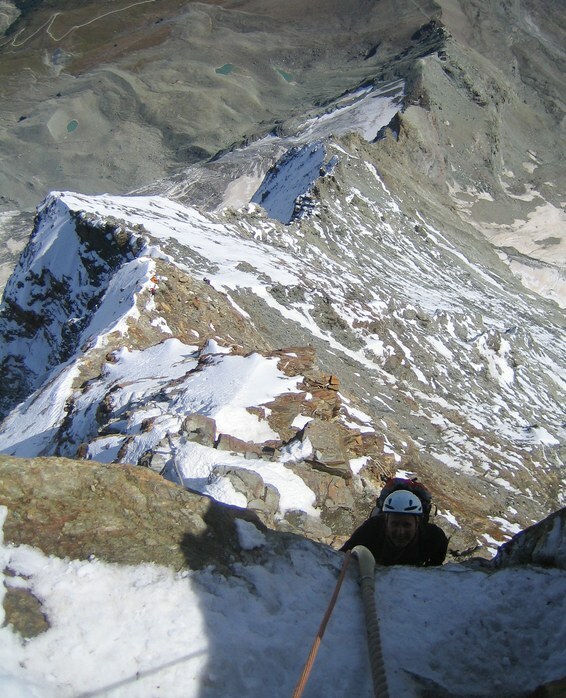 Fortunately, above the Solvey hut route finding is pretty obvious, the climbing never becomes hard, and we pressed on. 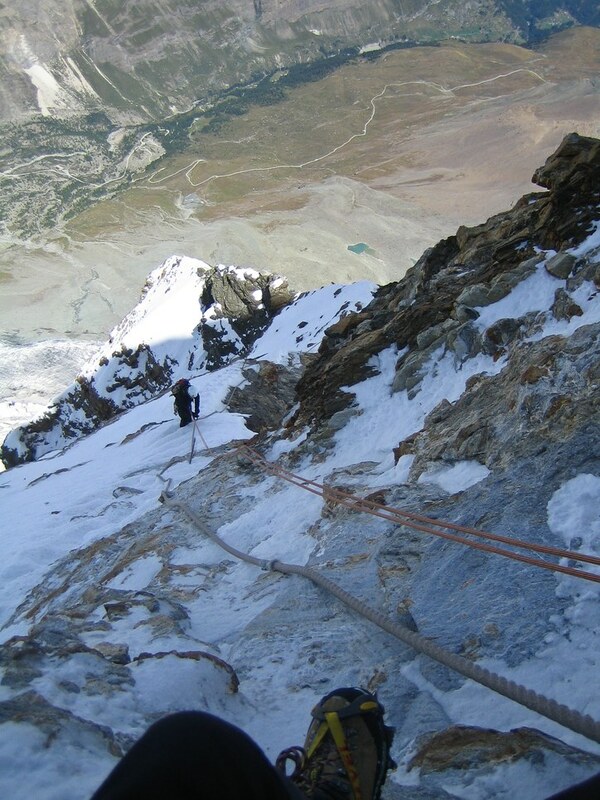 What was slowing us down was suboptimal rope management. 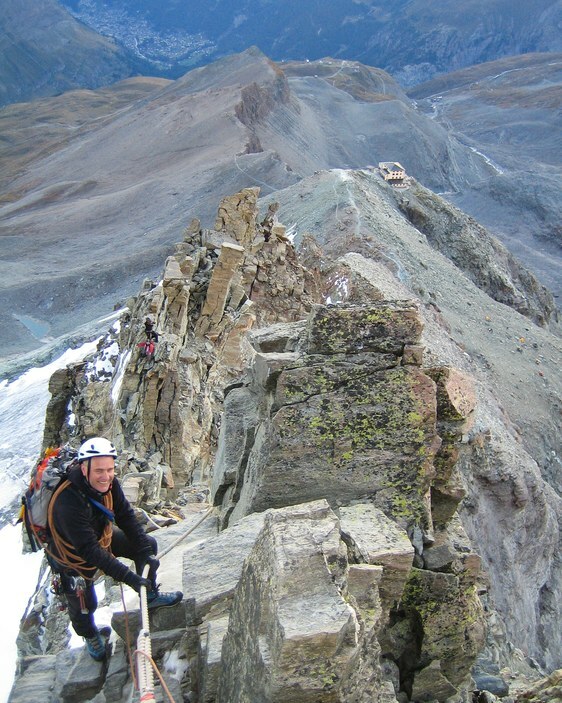 There are sections of "difficult hiking" mixed with steep snow climbing mixed with steep rock climbing. Some sections needed pitched belaying while some sections called for a running belay and others for no belay at all. If one doesn't know the route it is hard to foresee what's coming and to handle the rope efficiently. There was one advantage of our slow pace though: Once we had passed all the parties coming down from the summit, we had the mountain to ourselves! We summited at 1pm. The weather was gorgeous with blue skies and the views just stunning. 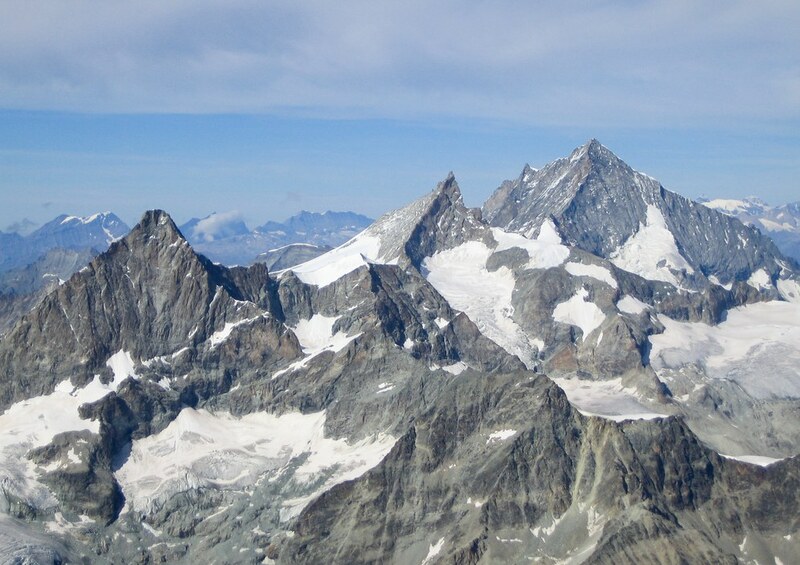 In the distance we could make out the Mont Blanc and Eiger-Mönch-Jungfrau massifs. Nearby lay the dozens of 4000er peaks of the Wallis region like Dent Blanch, Obergabelhorn, Zinalrothorn, Weisshorn, Dom, Täschhorn, Alphubel, Allalinhorn, Rimpfischhorn, Strahlhorn, Dufourspitze, Lyskamm, and Breithorn. We took a break of half an hour to enjoy the views and to take lots of pictures. 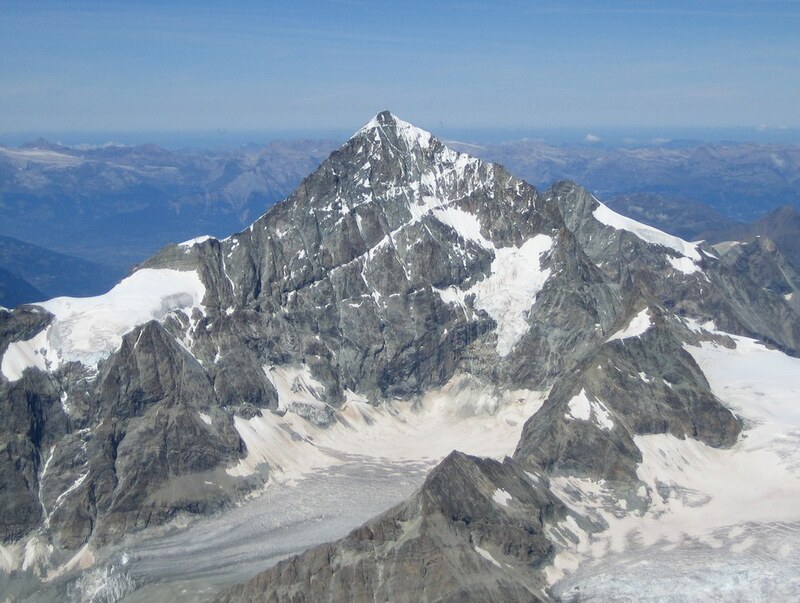 The Matterhorn is a double peak but we didn't bother to walk over to the Italian summit which is a few meters lower than the Swiss summit. I got the feeling that we might not be able to make it back down to the hut before nightfall. But since the weather was supposed to be stable for the next days I wasn't too worried. 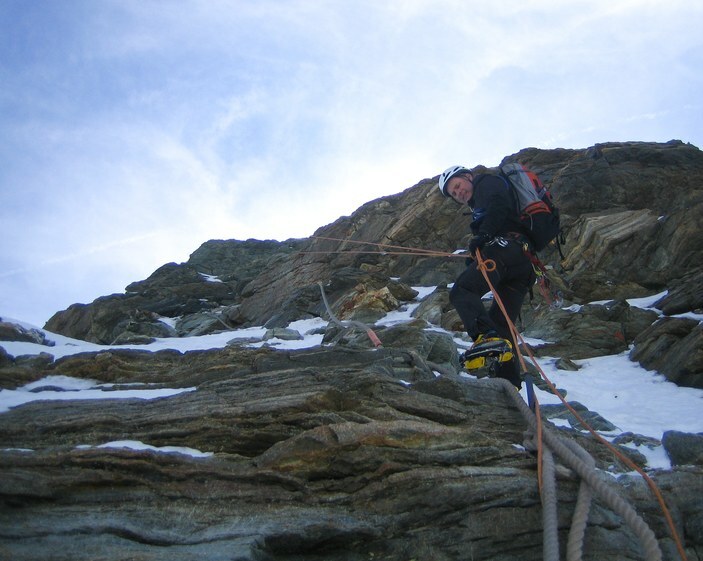 After downclimbing the snow slopes near the summit we continued to rappel the Moseley slabs with its fixed ropes. But since we only carried a 40 m rope this took a long time. After about 20+ rappels we finally reached easier terrain and eventually arrived at the Solvey hut. Even though this hut is only for emergencies it was packed with people, mainly eastern Europeans, who used it to spread the climb over 2 days. We looked inside but the hut was in bad condition and smelled awful. We continued our descend. 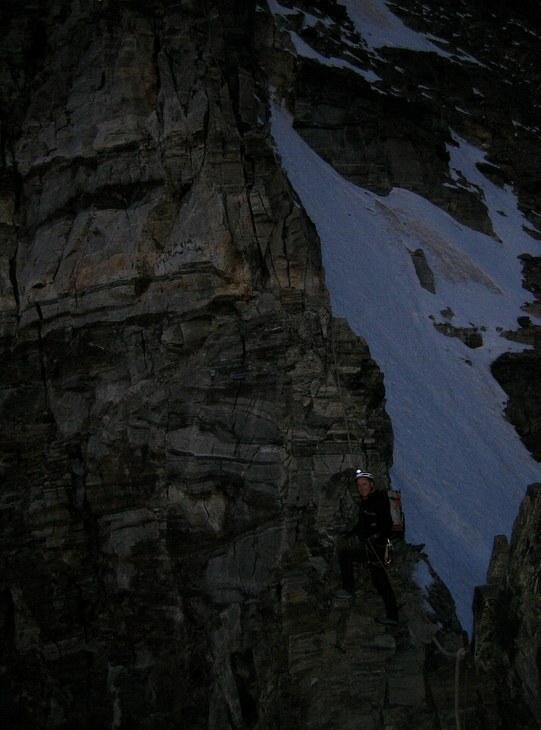 When we reached section of the route called "Auf dem Grat" we had gotten dark and we turn on our headlamps. 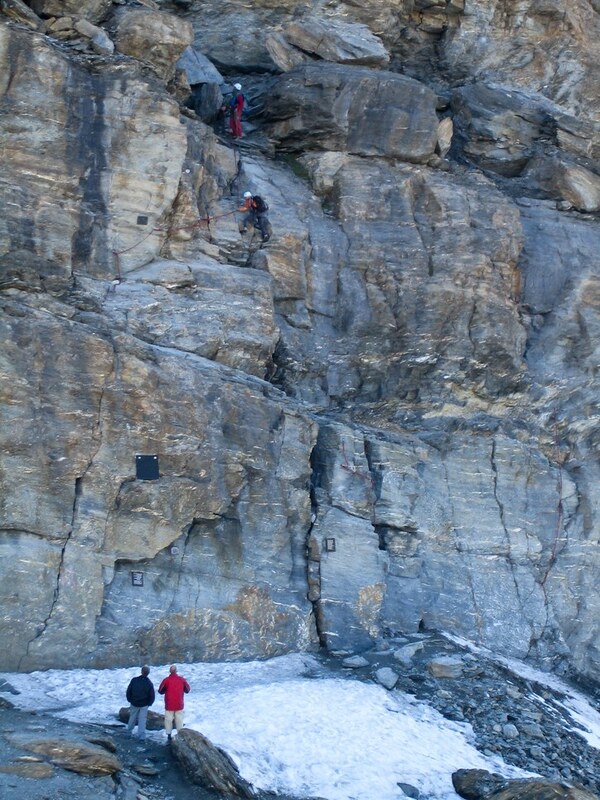 Here the route finding got tricky again. There were two huge cairns pointing toward a gully that leads away from the ridge and toward the east face. We took the turn but the gully was filled with scree and the climbing got ugly pretty quickly. It seemed that pretty much every hold was loose and I was very worried to drop something down onto Peter. Soon we realized that even though there were two obvious cairns pointing in this direction, this gully was not traveled enough to be the correct route. We also couldn't quite remember ascending this gully. So we retreated back to the ridge to reconsider. At that point it was 9pm. It had gotten dark and searching for the correct route was becoming difficult. 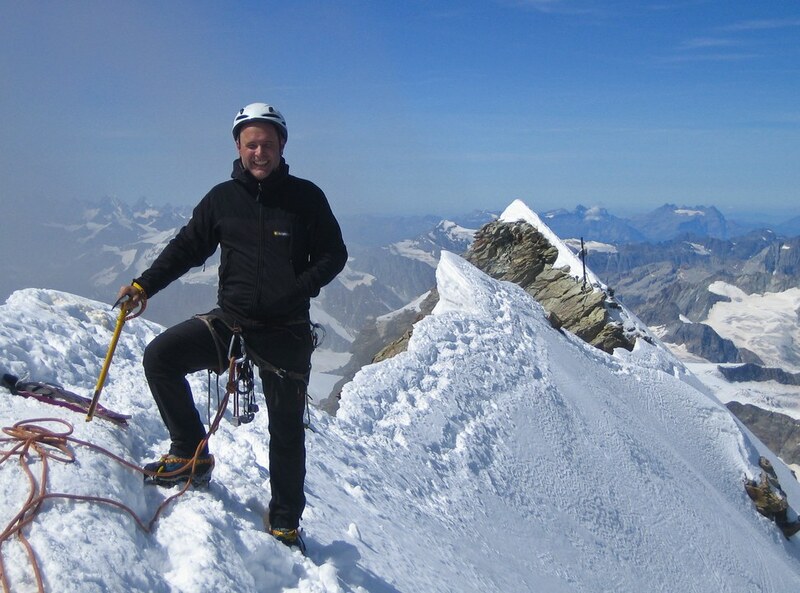 Peter looked around and thought that the route would probably continue directly on the ridge. But we decided that going down any further would be too dangerous. Since the skies were clear the weather was not a concern and we decided to bivy for the night. 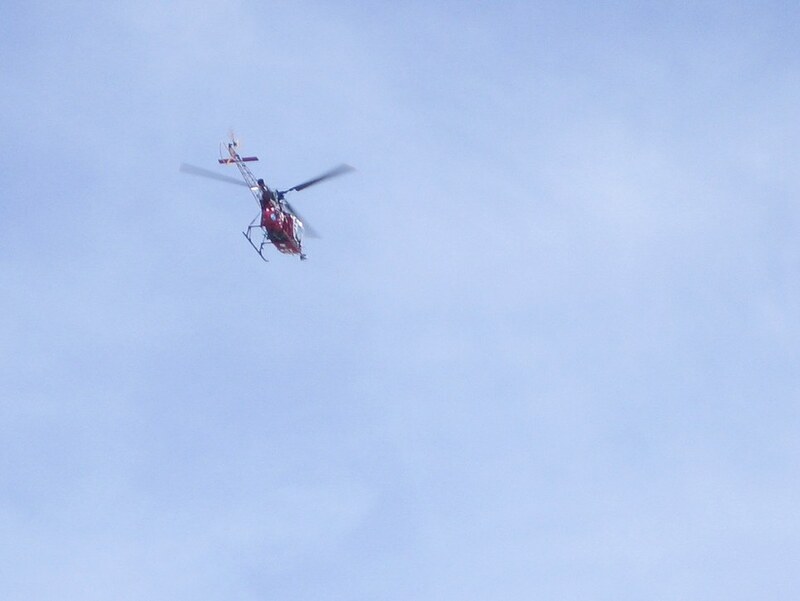 At about the same time, a rescue helicopter was hovering over the ridge about 200 m down from where we were. Apparently some climbers were being evacuated. We tried to shield our headlamps as to not draw too much attention to us. We would bivy but we weren't ready to be picked up by a helicopter at that point! However, it was an airy feeling being at 3550 m high up on the ridge in the dark with the chopper being busy nearby. We looked for a good place to bivy, found on, and cleared it of some rocks. Then we settled in for the night. 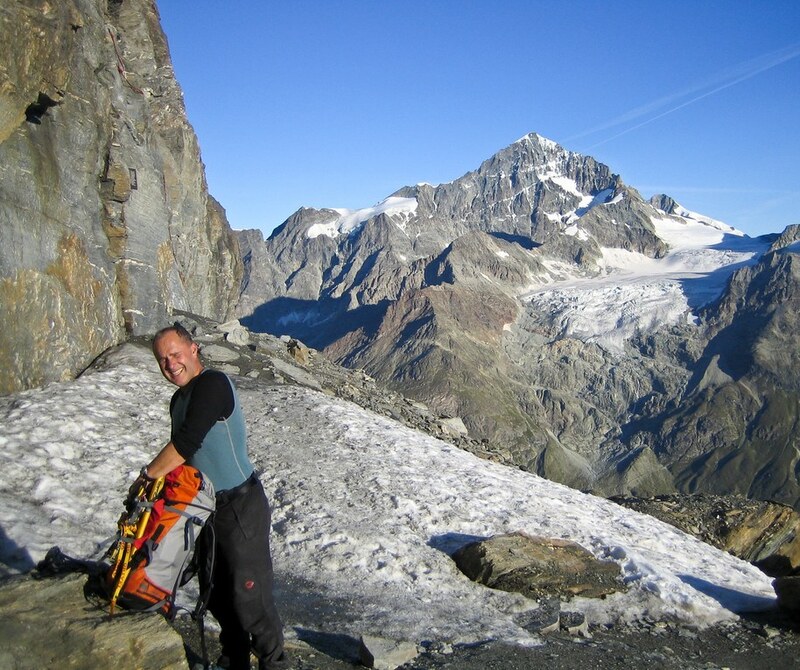 I put on long underpants and a down jacket and Peter broke out his big bivy sack. At wasn't very comfortable but it wasn't too cold either. The only problem was that we were out of water and quite thirsty. But I found some snow and let it melt in a bottle inside the bivy sack which solved that problem. 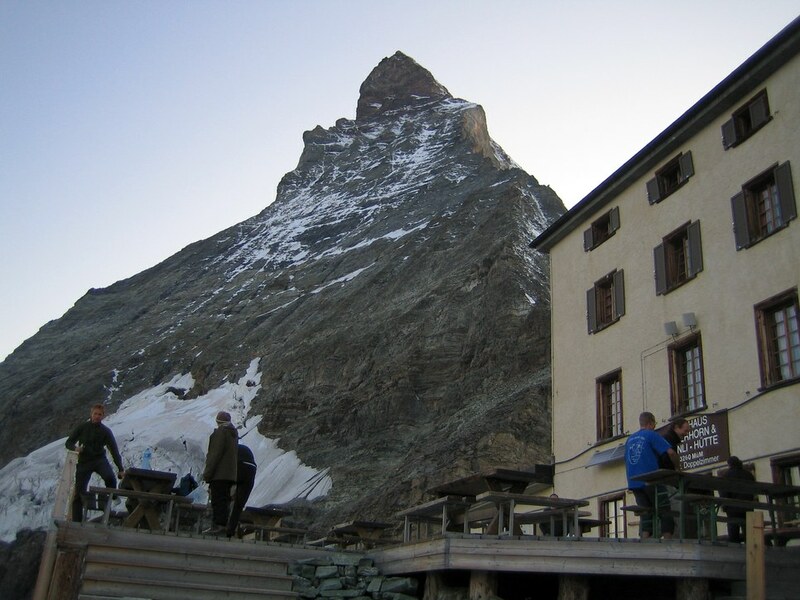 We marveled at the stars above and after some jocking around (an unplanned bivy on the Matterhorn!) we fell asleep. I suddenly woke up when somebody blazed right through camp, between where I was laying and where I had put my glasses and water bottle. It was 5:30 and dawning. 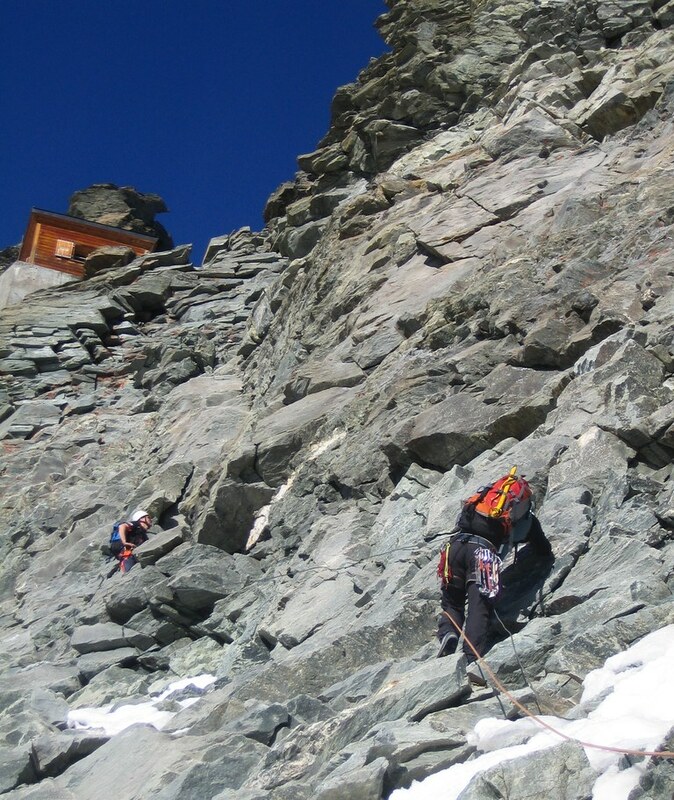 It turned out that we where laying right on the trail and that the intruders were the first guided parties who had left the Hörnli hut at 4:30am and were on their way to the summit. Within the next 30 minutes probably 15-20 guides with their clients passed. Since they were climbing up the steep ridge they couldn't see us until they were within a few meters of us. It was quite funny to see their surprised faces. 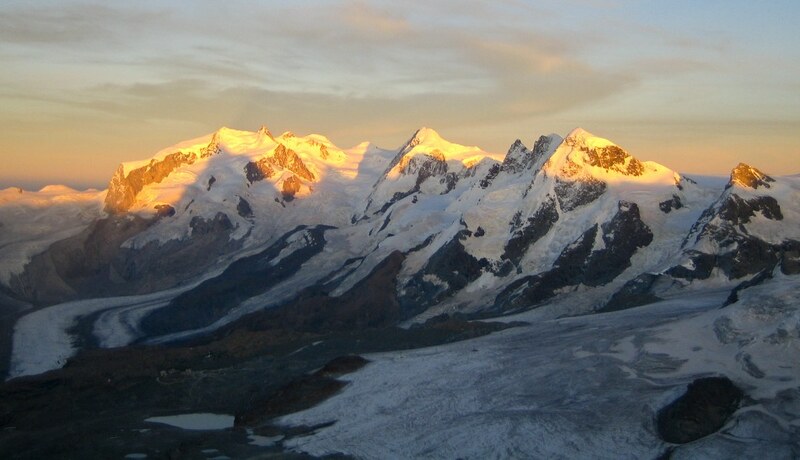 Since they had disturbed our sleep we considered them intruders and had some silly exchanges like asking them where they were heading... We also told some of them that the Matterhorn was "full" and that they should climb the Breithorn instead ("Make a left at the second traffic light!"). Some of the guides had a sense of humor but most of them looked down on us, the incompetent who didn't make it up and down "their" mountain in one day and should have booked a guide instead, in contempt. Around 6:30am, when the first wave of people had passed, we packed our stuff and started heading down. The sun had come up and the route was obvious now. 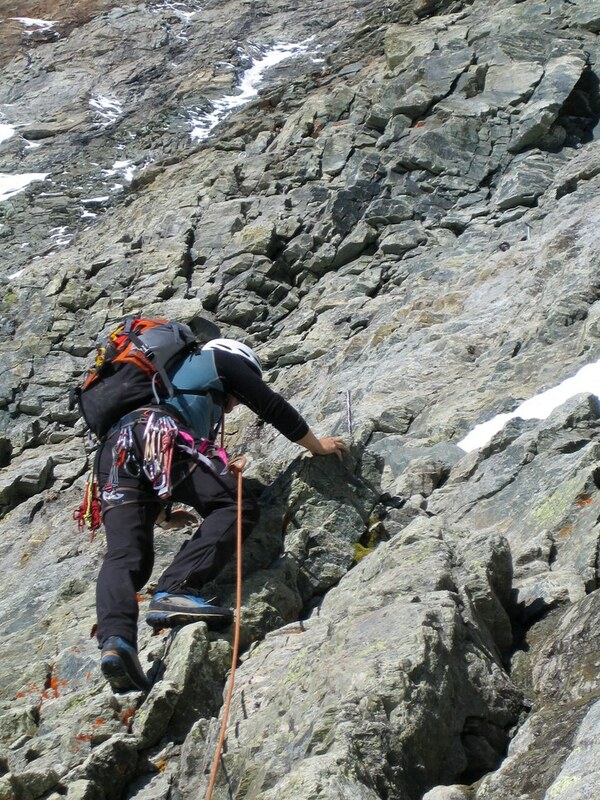 The first part of the route went very exposed right on the ridge and there was some ice on the rocks. A misstep would sent one down the north face. At this point we were glad that we hadn't tried to negotiate this section in the dark. Then we met a Serbian camera crew who were doing a documentary on climbing the Matterhorn and Peter gave them a short interview. 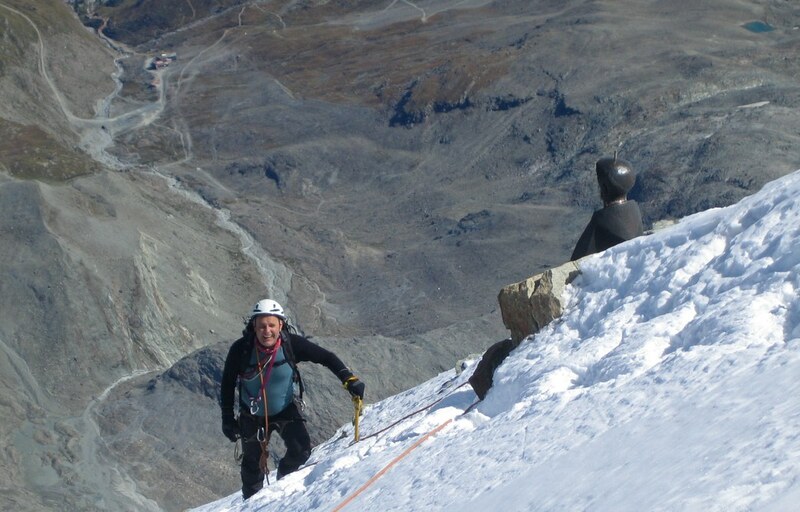 The rest of the descend was uneventful and we made it back down to the Hörnli hut in little more than an hour. 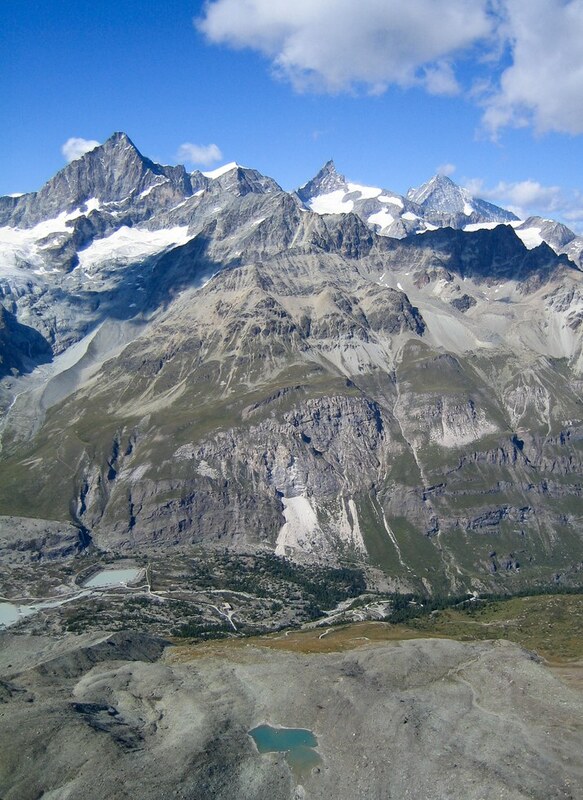 After downing some beverages we hiked back to Schwarzsee where the gondola brought us back down to Zermatt. We took the train to Randa and started the drive back to Munich where we arrived late that evening. 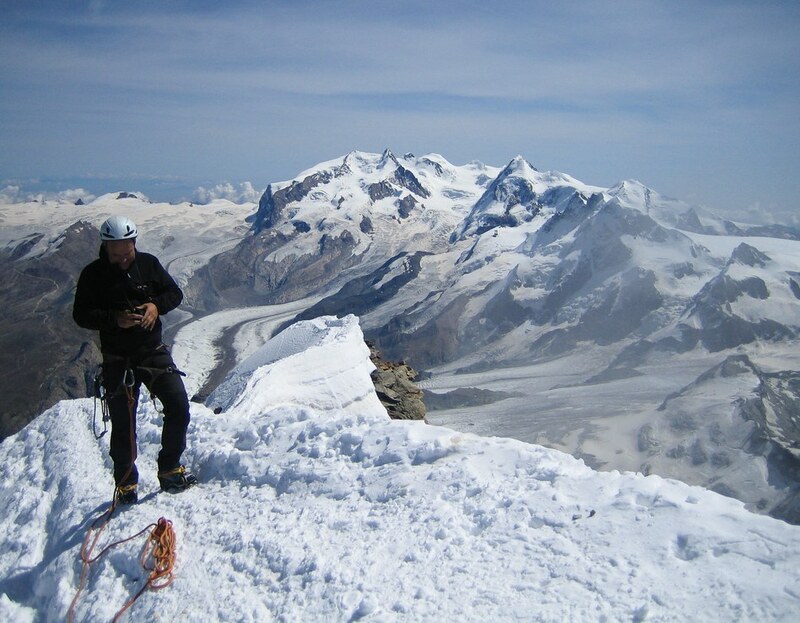 The Matterhorn was a great climb and even the climbing was much more enjoyable than what we had expected. 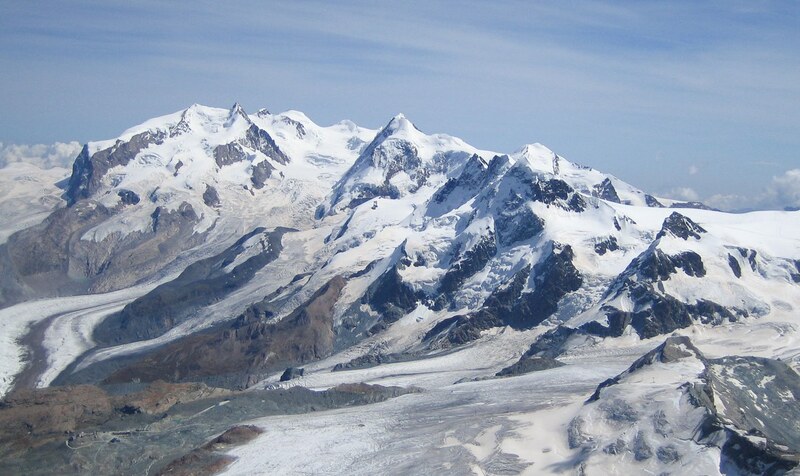 Despite it's fame and awesome look, the mountain is said to be a pile of scree held together by permafrost. However, the (correct!) route is pretty much cleaned of loose rocks by now. 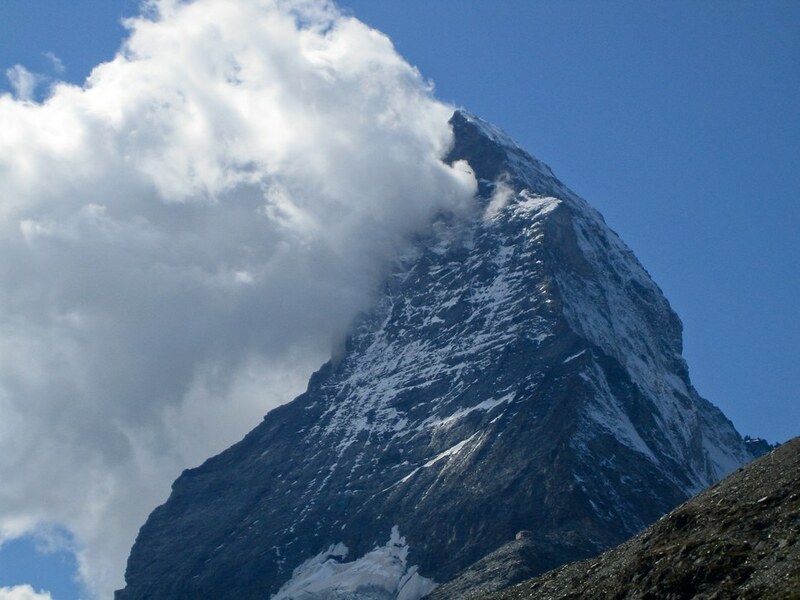 The Matterhorn is a mountain that pretty much every climber in the Alps sooner or later wants to climb. Our night high up on the ridge made it an even more memorable experience.